The kit includes two lesson plans, a relay race incorporating questions and tasks based on positive well-being, healthy eating and active living. Some examples include: what are the 4 food groups, do 5 jumping jacks, or compliment a member of your team. 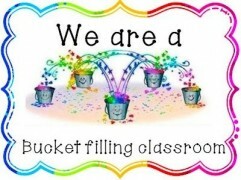 The second lesson plan is a classroom challenge where students are to track their bucket filling and bucket dipping for personal reflection and awareness. Both Lesson plans are designed to be incorporated into grades K-6.